subroutine If the Runner is not tagged, they lose 1credit. 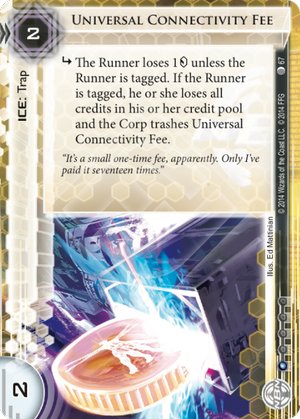 If the Runner is tagged, they lose all credits in his or her credit pool and the Corp trashes Universal Connectivity Fee. "It's a small one-time fee, apparently. Only I've paid it seventeen times." This card is obviously great for tag decks which uses Data Raven as the upper piece of ICE behind UCF leveraging it's ability immediately if the Runner goes "tag me" and can clearly stomp the Runner if you have another punishing type of ICE behind it or simply an ETR ICE to stop the run.